From lightly armoured to heavily armoured, the class of gladiator would determine that amount of armour each fighter specifically wore. The most heavily armoured the crupellerius would almost have wore a full suit of a armour, where as a lightly armoured gladiator like the dimachearus would have worn almost no armour except what was absolutely necessary. Of course the various pieces of armour worn by the gladiators were often common across many classes. For example manicas were worn by numerous gladiators to protect their striking arms from clashes, swipes and blows. If a gladiator were to hurt their striking arm, then the fight would be all but likely over for them. Therefore some of the choices in armament for these mighty warriors was to ensure the fight was the best quality as well as the personal protection of the gladiator. In a similar way, torso armour was typically uncommon with gladiators, forcing them to fight in a way which might appeal to the crowd with strikes to the torso and midsection ending the fight but cuts and slices to the arms and legs protected by manicas and greaves. 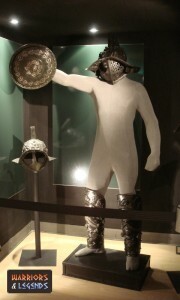 A gladiator exhibition, with the model wearing a helmet and leg greaves, and holding a parma shield. In addition, the overall weight of the gladiators armour would have had a direct correlation with their fighting style. 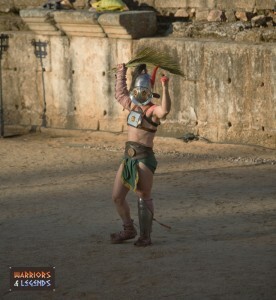 The heavier armoured gladiators would have to be more careful with their expending of energy as moving would require much more energy than a lightly armoured gladiator would need to use. This is typically why many of the gladiators wore a similar amount of armour, and it was typically rare classes like the crupellarius that were extremely heavily armoured. The gladiators actually wore a variety of helmets, or a variety of styles, but they are thought to mostly stem from the galea helmet. The galea helmet it what is classed as an imperial helmet and this was the common design by the end of the Roman empire. Often made of bronze, sometimes with brass trim, the galea may be adapted for various gladiator classes like the murmillo who had a full face covering on their particular helmet. 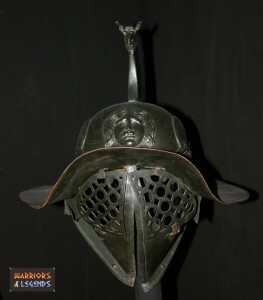 An example of a gladiator helmet. The manica was an arm guard, that was segmented meaning it was flexible when the gladiator moved their arm. Gladiators commonly wore one guard, but two were also used in some classes. Typically they would be worn on the attacking arm, like the sword arm, to ensure that small graves and cuts would not end a fight. The greave was a leg guard, often made in one piece, it offered protection from all kinds of attacks, and was often worn on both or at least the forward placed leg. Again the greave was designed to protect the legs, but also to try and keep the battle going, making sure that non deadly leg strikes would not slow a fighter down or render them unable to attack. The only gladiator thought to wear body armour was the provocator who wear a breastplate known as a cardiophylax. This was a bronze breast plate that could have a matching back or be a single front piece. This could also be classified as a type of Cuirass a breastplate. A successful gladiator with a small breastplate, manica and greave. While not technically a piece of armour, this belt would be worn around the waist to hold a sword, short sword or dagger in place. Used often by gladiators who started a battle with a separate weapon, like the retiarius, or the eques gladiators. The scutum was a large shield, used by Roman legionary and by the gladiators, around 40 inches or 100cm tall and about 16 inches or 40 cm wide. It was typically rectangular but could have square edges, rounded edges, or actually be more of an oval shape. The shape of the scutum was often determined by the unit or type of infantry using it, or even the time in which it was constructed. Therefore its likely the gladiators used a mixture of scutum shield types during their outings in the amphitheatre. Typically the scutum weighted about 10kg, not light by any means, but light enough to be effectively wielded in one hand while still being able to move quite easily. The scutum was used by scutalarius gladiators like the samnite and murmillo classes. the parma was a small shield, used by various types of Roman soldiers including cavalry. The parma shield was around 36 inches or 90cm wide and was typically circular in shape. Built on an iron frame, with a small iron boss in the centre the parma was strong and capable of being a pushing weapon against a foe due to its solid construction. With a fairly diverse mix of armour available in a number of combinations, the gladiators of ancient Rome were typically at a loss or benefit in some way. More armour meant more protection but less speed and even manoeuvrability. Less armour would mean you could move faster but if you get stuck there could be massively more damage. Like anything in the amphitheatres of Rome, choosing your armour was a tricky proposition for any gladiator.